High-performing people are critical for high-performing organisations. Whether driven by the need to improve efficiency, productivity, or profitability, or by the desire to provide outstanding customer service, the combination of two components is critical: selecting talented and high-potential people to carry out the organisation’s mission and creating a culture that supports them (Donna Rodriguez et al., 2002). To meet these challenges that most of the organisations are facing, CATRO Bulgaria perceives competency models as one of the most crucial instruments for assessing employees’ performance on the job against well accepted standards in order to constantly improve it by maximizing the potential of human capital in your organisations. Thus, competency models are often directly linked to the corporate goals and strategies in organisations providing insight on their core values, mission and vision. CATRO Bulgaria assists its clients in setting up and aligning competency models to their overall business strategy. This will help them not only to recruit and select the most appropriate employees for their organisations, but also to distinguish superior from average performance, to set clear goals for training and development, to ensure succession planning etc. 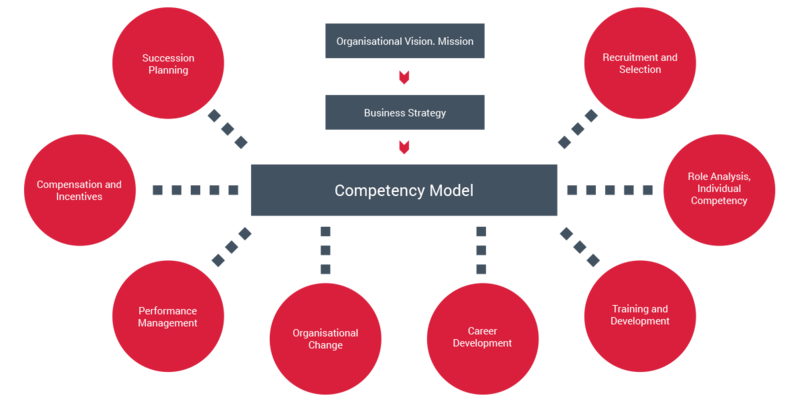 Competency models are not meant to just describe, but actually to influence behaviour by defining behavioural indicators, that are critical for the organisational success. Our role as Organisational Development consultants is to show the pathway between the day-to-day employees’ behaviour and broader strategic organisational goals, to ensure consistency by using common language that makes the core organisational anchors clear and understandable for everybody in the entity. Development of individual learning plans for employees, based on measurable “gaps” between job competences or competency proficiency levels required for their jobs and the current competency staff portfolio. Provides regular measurement of targeted behaviours and performance outcomes linked to job competency profile critical factors. Developing “stepping stones” necessary for promotion and long-term career growth. Careful, methodical preparation focused on retaining and growing the competency portfolios is critical for the organisation survival and prosperity. Provides a method to assess candidates’ readiness for their job roles. Compensate employees by using the competency model to structure the payroll scale between jobs or to evaluate employees for salary increase. Due to the link between business objectives and performance levels, competency models are also seen as relevant benchmark for payroll purposes and the so-called “performance-related-compensation”. Supporting organisational change efforts by developing broad systematic basis of future-oriented competences. The ability to train, assess, select, promote and reward employees in line with a desired future state can help speed up the transition of your organisation.